“The food hall market trend is moving extremely fast. In the first nine months of 2016, the number of food hall projects increased by 37 percent, which is huge,” said Cushman & Wakefield’s Chris Hunt. WASHINGTON — Food halls are opening across the country at a record pace, and the Washington area will be seeing more of them. “The food hall market trend is moving extremely fast. In the first nine months of 2016, the number of food hall projects increased by 37 percent, which is huge,” Cushman & Wakefield’s Chris Hunt told WTOP. “On average, about one new food hall is announced every week now and we think that momentum is going to continue to grow,” he said. In the Washington area, Cushman & Wakefield is tracking about 15 projects that have food hall characteristics, about a third of which are either already under construction or soon will be. Chef Jose Garces is opening a 20,000-square-foot Latin-themed marketplace in a new, mixed-use development near Union Market in Northeast DC. Chef Mike Isabella is opening the 41,000-square-foot Isabella Eatery on the top floor of Tysons Galleria. Quarter Market, a multi-vendor food hall that will be part of the redeveloped Ballston Common mall, Ballston Quarter. There are what Cushman & Wakefield calls “mini food halls,” such as Grace Street, which opened in Georgetown this fall. Grace Street is about 5,000 square feet with a handful of small vendors now — including a sandwich shop, a juice bar and a coffee roaster — with plans to add a few more small vendors. 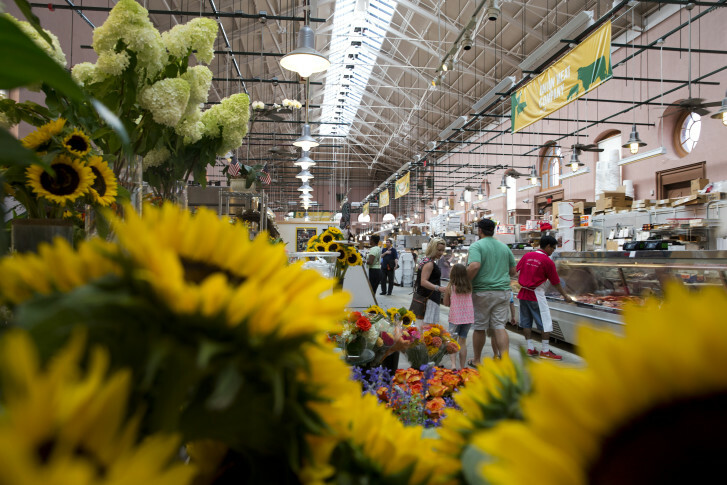 Among established food halls, Cushman & Wakefield ranks D.C.’s Eastern Market and Union Market among the top 20 in America. Bon Appétit has ranked Union Market one of the five best food halls in the country. What is driving the food hall boom? The biggest food hall of them all, currently under development, will come from celebrity chef Anthony Bourdain. Bourdain’s Pier 57, at New York City’s Hudson River Park, will be a 560,000-square-foot food hall with more than 100 vendors, though its opening date has been pushed back several times.